Cut the tomatoes top off. Scoop out the pulp and reserve for later. 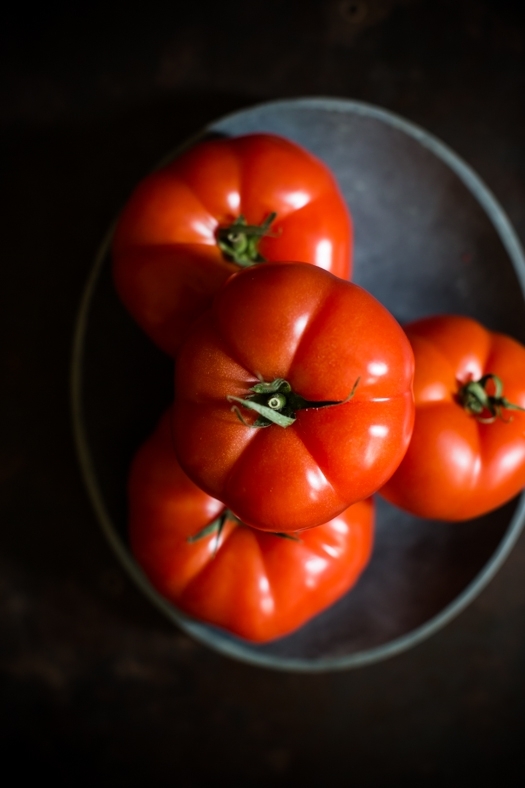 Place the tomatoes in a large baking dish. In a large skillet set over medium heat, heat 2 tablespoons of olive oil. Add the onion and eggplant. Sautee for about 5 minutes. Add the zucchini and cook for another 5 minutes.Add the peppers, garlic and reserved tomato and cook for another 5 minutes. Meanwhile, place the farro in 2 cups boiling water. Reduce the heat and simmer, uncovered until the water is absorbed. When the farro is cooked, add it to the vegetable mixture and stir. Add the thyme and parsley. 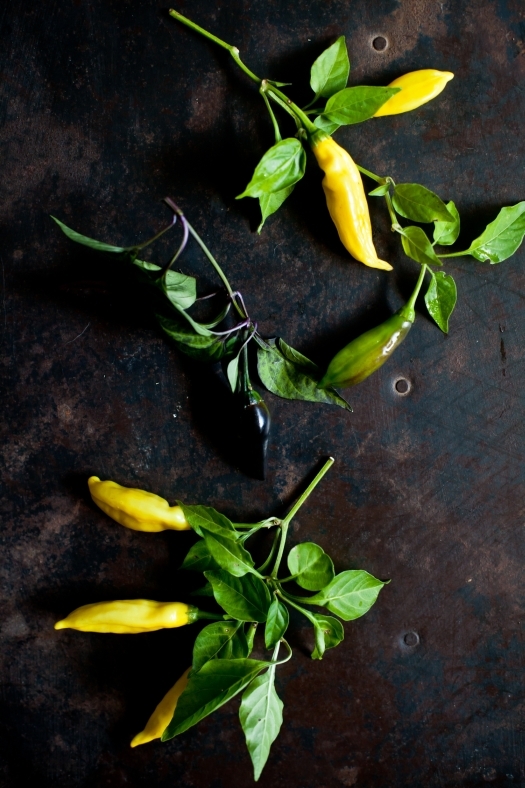 Remove from the heat and let cool slightly. 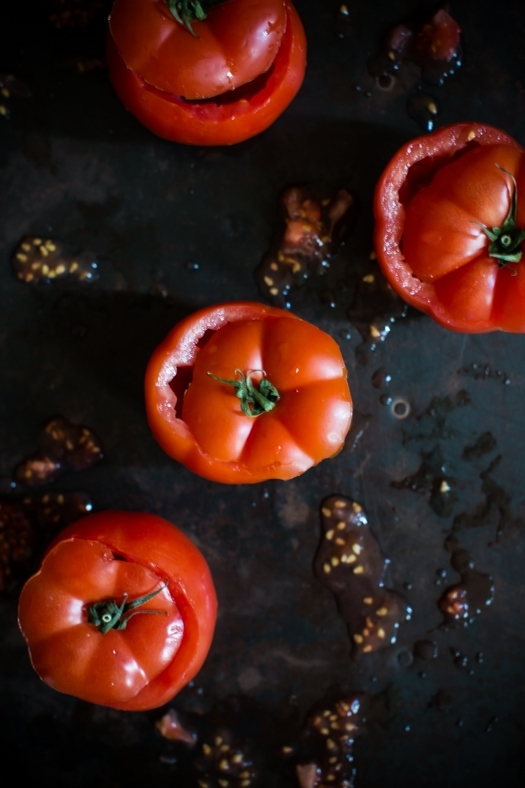 Feel the hollowed tomatoes with that mixture, sprinkle with the feta. Drizzle with the remaining olive oil and bake for about 30-40 minutes. Serve warm or room temperature with a simple green salad. I like how this dish is like a transition into fall. It still has that summery feel with the tomatoes but it's a great way to transition into colder weather! Soon I'll be having greek-style stuffed aubergines! Hi, the recipe looks great and I want to make it for dinner, but where does the garlic come into play? Joey: right after the peppers. Never tried farro. Gotta see how it tastes! It's amazing how many different versions of stuffed vegetables exist all over the world. I once had some made by a Kurdish woman. Hers were flavored with cinnamon. They look delicious. I love recipes with a beautiful tradition attached. Great recipe! 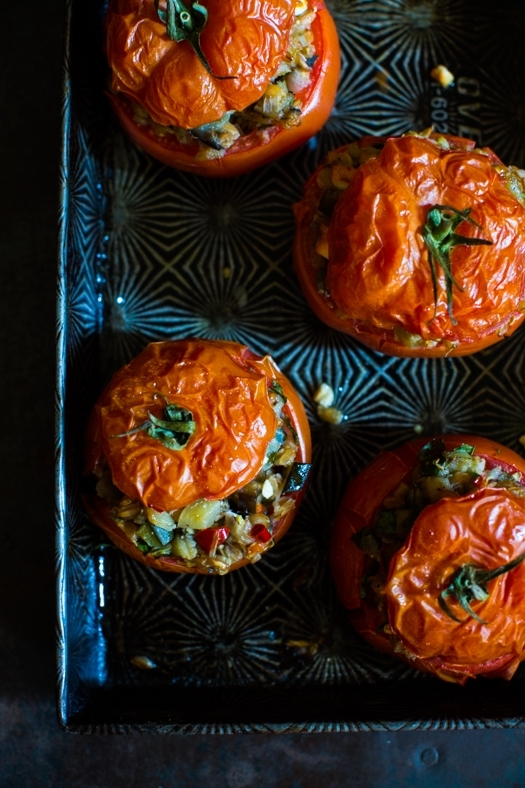 I have been wanting to give farro a try- and it seems to be a perfect ingredient to stuff the tomato (as well as something different than the usual rice). This looks so delicious and your photographs are, as always amazing. I have your book so why aren't my photographs like yours!! Je découvre votre blog et les photos sont très belles, me reste à tester les recettes ;). I love the gorgeous color contrast. I bet these tomatoes are delicious. I love tomatoes stuffed with sausage and rice too. These remind me of the stuffed vegetables we had at my French friend's home in Tours this past summer. She has a flair for finding just the right balance of ingredients. I love your combination. Looks delicious. Hope you're doing well! I wonder if I could find faro here, I assume it is a grain? This sounds wonderful and so easy. Thank you. These look delicious! My grandmother and mother also used to make stuffed vegetables, and I have fond memories of helping them prepare the filling and stuffing whatever vegetable was available and in season. Thank you for sharing -- you've made me feel nostalgic! What a lovely post, Helene! 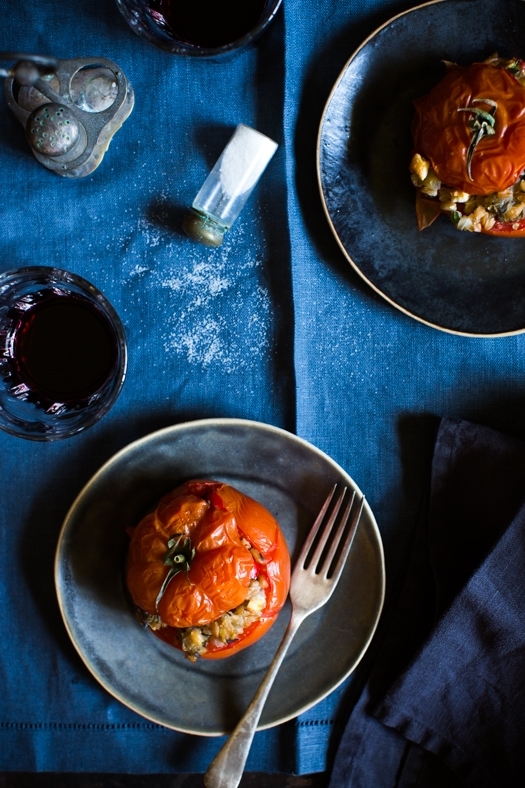 Stuffed vegetables are pure comfort. I made stuffed bell peppers a few days ago. I filled them with basmati and wild rice, portobello mushrooms, minced meat, and lots of thyme. Will make your version soon. Such a beautiful dish! I love stuffed vegetables and its such a unique combination, thanks for sharing!